The Buffalo News’ Emma Sapong wrote an article about homelessness with a focus on homeless mothers in transitional housing. Two local transitional housing programs are highlighted in the story: Gerard Place and Cornerstone Manor. Additional comments are provided by Bill O’Connell, executive director of the Homeless Alliance. When folks are homeless, they’ve already gone through every friend and family resource that they have for inexpensive and reliable child care, so that’s why they are staying in a shelter. High housing and child care costs put many already struggling mothers in financial binds that can lead to homelessness. Download the Poverty Challenge Participants’ Guide here. Check out the flyer for the Poverty Challenge here. From May 6 through May 7, a number of community leaders have agreed to maintain a poverty budget to demonstrate how many of our area’s residents are not able to meet their basic needs. 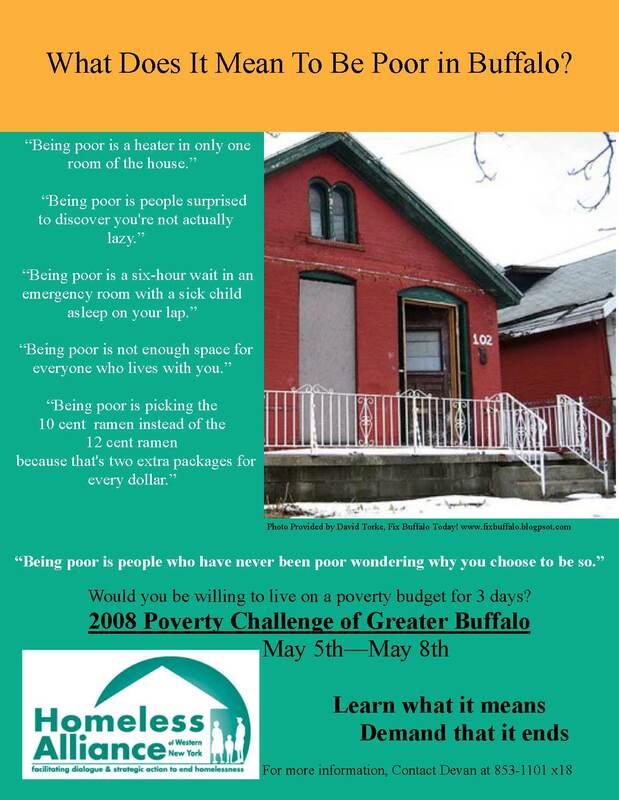 With the support of a number of religious leaders, elected leaders, and other community leaders, the 2008 Poverty Challenge of Greater Buffalo is an attempt to raise awareness about the nature of poverty in Western New York. • The senator’s nine-page position paper focuses on specific actions she would take on issues ranging from enforcing child support payments to nurse home visitation for new at-risk mothers. On a larger scale, the Senator touts universal health care, a moratorium on foreclosures, and the creation of at least 5 million “green collar” jobs for low-wage workers. • Details are sketchy, but include access to safe, affordable housing, job programs, and financial and medical assistance to single parents. • America’s most famous POW takes aim at urban poverty by taking back the streets, improving urban school systems and updating job training programs. • Again, specifics are vague. •The former first lady would work to end child hunger by strengthening the food stamp program, improving the food safety net and providing more access to healthy, fresh food. •She would provide economic opportunity to low-income families by raising the minimum wage, and expanding new job training opportunities. •She would also establish a pilot program to reduce homelessness among veterans, and develop a community based re-entry plan to help ex-offenders receive job training and placement as well as drug and mental health counseling. • The son of a single mother, his most ambitious anti-poverty policy would be to replicate the success of the Harlem Children’s Zone in 20 cities nationwide. • He also wants to spend $1 billion for a jobs program that would place the unemployed into temporary jobs and train them for permanent ones. • He would also offer incentives for businesses to relocate, or start-up, in distressed inner cities. • The former naval aviator equates economic prosperity to the war on terrorism. “For the same reason you have to fight the war against the Islamic extremists on the international level, you have to ensure the streets are safe so people can go to work and businesses can operate,’ said the senator’s senior policy advisor. • The burgeoning crime rate is compounded by an inhospitable economic climate that McCain would fight by lowering taxes and improving business investment incentives. It’ll be easy enough to be confused, if not overwhelmed, with the state Legislature back in session and the special interests descending upon lawmakers peddling causes both noble and ignoble. There ought to be perhaps more pressure than ever to raise the pay of the state’s judges for the first time in a decade. The judges themselves are making the very persuasive case one would expect of them. Then, again, it’s a safe bet that the very legislators whose votes are needed to give those judges a raise will demand one for themselves as well — lame as that argument is, at least until they can reform the Legislature first. But what about the poor, the people living on government subsides? State welfare benefits haven’t been increased since 1990. What’s known as the basic welfare grant for a family of three has been stuck all those years at $291 a month. A family of three on welfare also can get up to $426 a month in food stamps and a shelter allowance of a little more than $300 a month. The specific amount of the housing subsidy varies from county to county. It’s unconscionable that the Legislature has gone this long without adjusting basic welfare benefits. Everyone is affected by inflation, of course, from judges and legislators to the poorest of the poor. That latter group, in fact, may well be hit all the harder since so much of the little money it has goes to the most basic of necessities. The price of milk, for instance, has gone up by 94 percent since 1990. The price of fuel oil and natural gas are about twice as high now than they were when the subsidy for home heating costs last was adjusted in 1987. In each case, that’s much higher than the overall 55 percent increase in the rate of inflation since 1990. New York’s courts, including the Court of Appeals, have ruled five times since 1987 that the welfare shelter allowance is illegally low. That requires welfare families to use part of their basic grant, scant as it is, to subsidize housing costs. Even now, more than a decade after rewritten welfare laws reduced the number of New Yorkers on public assistance by 61 percent, more than 535,000 people — including more than 300,000 children — live this way. They need the Legislature’s attention as much as anyone. A cost of living adjustment in the basic welfare grant, to $475 a month for a family of three, is urgent. The Assembly, but not the Senate, voted for a 10 percent increase in the basic welfare grant last year. This year the Democrats in the Senate are pushing for a 25 percent increase. That money is readily available, too, despite the state’s $4.3 billion budget deficit. Federal block grants pay for the state’s welfare costs. Other states have used the block grant since 1996 to raise welfare benefits. New York, though, has invested it in so-called rainy day funds. And now it’s raining, and raining hard, on the people who most need state government’s help. THE ISSUE: The state’s welfare grant hasn’t be raised in years. THE STAKES: Without an increase, inflation will erode subsistence funds even more.